Preheat oven to 400 degrees F (200 degrees C). Line a shallow baking pan with aluminum foil. Place salmon skin-side down on foil. Spread a thin layer of mustard on the top of each fillet, and season with salt and pepper. Top with almond flour, then drizzle with melted butter. 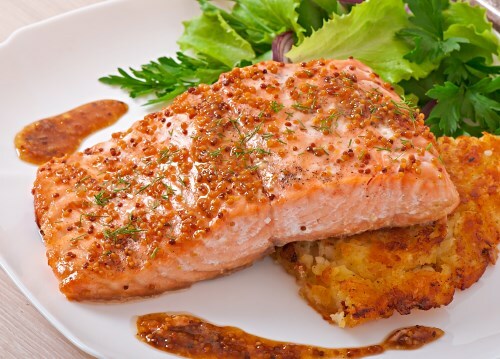 Bake in a preheated oven for 15 minutes, or until salmon flakes easily with a fork.